How do they compare to other methods of body fat measurement? Tanita's patented "foot pad" design sends a low, safe electrical current through the body to measure its composition. The electrical current passes more easily through lean muscle than fat. Body composition is calculated mathematically, based upon the speed at which the signal passes through the body. Modeled after monitors Tanita developed for the medical and fitness industries in 1992, the TBF-511 and TBF-515 use the same revolutionary method of measuring bio electrical impedance analysis (BIA) that give you a fast, easy, less intrusive, safe, and accurate way of measuring your body fat. As simple and easy as stepping on a traditional scale, it gives you an accurate reading of both weight and body fat within 30 seconds. How do they compare to other methods for measuring body fat? Tanita's accuracy is within +/-2-3% of DEXA (Dual Energy X-ray Absorptiometry), the "gold standard" for body composition measurement, and offers the same accuracy as underwater weighing. Tanita currently offers three user modes that account for physiological differences among people (for example, a very athletic adult will have different body characteristics from an average person with a fairly sedentary lifestyle). 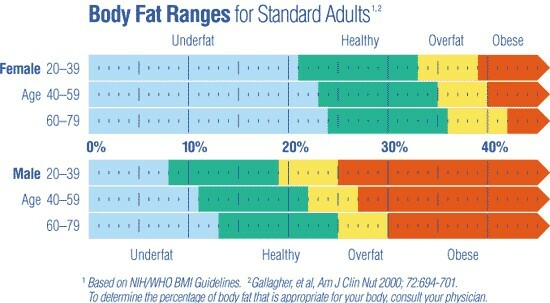 To receive the most accurate body fat reading, make sure that you choose the right mode for your body type. If you select the wrong mode, your reading will be applied to the wrong calibration and could result in an incorrect body fat reading. For adults aged 18 and older who have moderately active to inactive lifestyles. For children up to the age of 18, who are over 3-1/2 feet tall (107 cm), who have moderately active to inactive lifestyles, and whose bodies are still developing. Woman have more body fat than men--about five percent more. By nature, a woman's body is developed to protect her and a potential fetus. As a result, women have more enzymes for storing fat and fewer enzymes for burning fat. Additionally, the estrogen women have activates fat storing enzymes and causes them to multiply. Women experience more changes in hydration levels than men because of their menstrual cycle, and this can affect body fat measuring, particularly using the BIA method. Retaining fluid may also cause weight to fluctuate day-to-day during this period causing additional variation in the body fat percentage. Female users of BIA products should be aware of their natural monthly body cycles. To establish a baseline for monitoring body fat, many women find it useful to chart their readings every day for a month. Afterward, monitoring at regular intervals can anticipate monthly fluctuations. Hormonal changes due to pregnancy or menopause may also cause water retention and variations in measuring. Changes in hydration levels can also be due to food, caffeine or alcohol consumption, strenuous exercise, stress or illness, or the taking of prescription drugs. To successfully monitor progress, women should remember to compare weight and body fat percentage measurements taken under the same conditions over a period of time. Pay attention to fluctuations caused by menstruation. And stay within the Women's--not the Men's--Healthy Body Fat Range! This helpful feature estimates the amount of calories you can consume in one day to maintain your current weight. To lose weight, try consuming less calories than the amount shown. By automatically storing your results, the recall feature can show you the difference between your current reading and your previous one. This feature is particularly helpful for users who are on a diet and/or exercise program. The graph feature records your body fat percentage each time you take a reading. 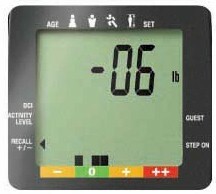 It calculates averages for these stored body fat readings and displays them as graphic bars within the chart area. Over time, the graph places the bars in a sequence, making the elements of a line graph that can show you how your body fat levels are changing. The graph calculates all of this automatically, without the need for you to press any additional buttons - and it's done in real time, so you'll know instantly if you're on the right track.